I travel not only because I love the feeling of discovering new, often famous, places, but also for the chance of taking a challenging and life-changing personal adventure. At the end of journey, regardless of the destination, either it is Paris or two streets away from my home, there is my way of seeing which is qualitatively different. I am also happy to find out that I am not alone and to discover my curiosity in other travellers' works and travels. I was familiar with the work of Mihaela Noroc for a couple of time, especially via social media but also on her website, but the joy of actually reading her book was even greater. 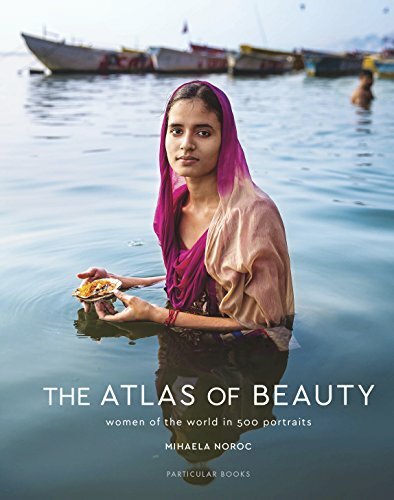 Through her travels to over 55 countries, she is looking for proof to map The Atlas of Beauty, an impressive collection of women portraits to be released on 26 September 2017. The idea started during her trip to Ethiopia when she encoutered the natural charm of the local women: 'I realized that the wonderful women of our planet need much more attention, and that true beauty is more than what we often see in the media'. The women featured in the book do have stories of resilience, courage and adventures, as mothers, daughters, sisters or grandmothers or just as citizens of the Planet. But behind each story there are the author's personal stories: 'Traveling to so many fascinating places has given me some of the best times of my life, but also the most challenging. I've been close to war zones and wandered through dangerous slums. I've been freezing, overheated, emotional. I've been out of money and I've been ill while far from the comforts of home. But meeting so many incredible women kept me moving forward on my path with enthusiasm'. It is hard to say which story or photo I loved the most. Each and every one of them has a charm and a life lesson that changes you or opens a different door towards human knowledge. This was part of the author's experience as well: 'I owe everything I am today to these women. Each encounter taught me to be a better person, to see beauty everywhere, and in every thing, not just on the surface'. A 5-star book I recommend to every insightful traveller around. I also recommend to follow the dedicated Instagram account, if looking for more regular inspiration.